Outdoors: The parks in these old cities are always the most amazing for me. 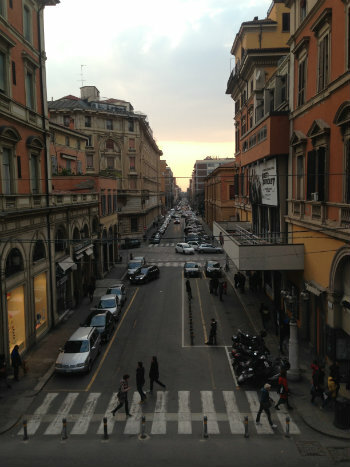 In Rome, Passeggiata del Gianicolo was a delight—looking down upon the city from a tranquil public space. In Bologna, it was Giardini Margherita—tucked into a lonesome corner of a city as a tranquil little oasis. Whenever I get to that green space, I can breathe deeply and reconnect. It’s very meditative. I also greatly enjoyed a trip just into the Dolomites while I was there. Oh, and how could I forget Salerno, the entire coastline was an opportunity to take in a great big deep breath and enjoy. Food: The pizza in Salerno was really quite wonderful. There, I also had the best eggplant parmesan I’ve ever had. In the northeast, in Sacile, I enjoyed tincredible lasagna. Then there’s the gelato. Americans, it’s like ice cream, except tastier. Sights: The Pantheon, in Rome, was pretty incredible. The structure was far more massive than I had anticipated. There seemed to be a unique balance of simplicity and complexity that I haven’t quite wrapped my head around yet. Piazza Maggiore in Bologna was pretty remarkable as well, which boasts many sights to see whichever way you turn (including a cathedral that is still being built after many centuries). But possibly the most alluring place we visited was Genoa. You probably haven’t heard of it, yet it’s the sixth largest city in the country. Looking down from the mountains that keep watch over the bay, I could literally see the centuries of different architecture mingled together. There is something about that city that is alluring to me. Community Interaction: This was the obvious highlight of the trip, and the thing that far outstretched anything having to do with food or affection (though those two things are important parts of the community). We ate in homes, met at cafes, and spent hours at the table with one another discussing just about everything. Italians are passionate about life, in general, and if you can get them talking, you’re in for a treat. Those who I had the privilege to meet certainly had some really important things to say. It was a gift to see the country through their eyes. In short—visit Italy, but be prepared for it to be fantastic.